I think it is a preventative for getting sick. Every person I’ve talked to has told me different benefits of consuming emoliente. I’m surprised something this healthy (and not very palatable) is popular regardless of age or class. All of the ingredients are pretty healing on their own and must be a powerhouse as the mixture. I have seen emoliente kits in stores (a package of dried herbs) but getting it on the street is an experience of its own. 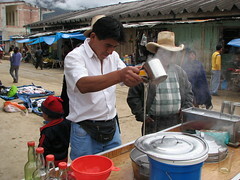 The vendor makes your drink by putting in a quantity of his (or your) choosing of each herb and then mixes it with a viscous mixture of aloe vera and flaxseed liquified. He mixes it by pouring it at arm’s length multiple times and I can’t help but be reminded of getting slimed on family double dare, because it looks like a giant stream of snot, every time. But I love the viscous texture and the flavor and the boost it gives my system. Aloe vera, scraped right off the stem. 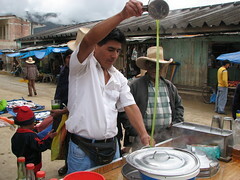 I have also seen them put apples in the boiling mixture with the flaxseeds and horsetail to add some natural sweetness, which is nice because most of the ingredients are quite bitter on their own. Here’s a link to an emoliente recipe (in Spanish), but it’s not how I would make it. I’ll post my recipe as soon as I can, but to me the most important ingredient is the alfalfa juice! I just stumbled on your blog by pure coincidence I’m French but I live in Peru. Lima, to be precise. 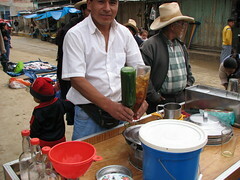 I haven’t tried emoliente yet because I don’t dare to buy anything from stalls on the streets >_< I want to though. I love “weird” textures and colors. I’m excited you found my blog! I encourage you to try the emoliente. I’ve never suspected getting sick from it and I think it boosted my immune system. I’m thinking of writing a little vegetarian guide to Peru book–do you think it’s worth my while? Here’s my list of places I’ve eaten in Lima and my thoughts. Enjoy! ps You might want to check out happycow.net. It’s a pretty good list of veggie restaurants with reviews all over the world. Govinda; Schell 634; menu is about sl.9? Homemade tofu and yogurt. Lots of veggies and good-tasting food. Angelito Verde; 450 Benavides; haven’t eaten there. sl.7 menu and homemade ice cream. Bircher Benner; Jirón Diez Canseco 487? It’s on the main street east of the park. Overpriced, nice presentation, not impressed. Villa Natura; Ucayali 326; Cheap good food, usually packed for lunch. Service is bad and they don’t serve anything off the menu until 12pm. The mushroom ceviche is amazing and the menu del dia is always a good deal. Ucayali 212; right next door to villa natura. haven’t tried it. Block 300 of Camana has at least 4 vegetarian restaurants. My favorite was el Paraiso de Salud (it is across from about 3 veg restarants in a row, it is the one alone). Good food, typical Peruvian Vegetarian stuff with carne de soya. 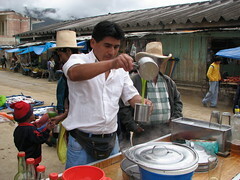 They have sugar cane juice, good smoothies and the best breakfast in town, or at least the only real breakfast in town. The other restaurants I’ve tried are Vida Sana and los Frutales. Both okay. Don’t get the sandwiches with one ingredient, really dry and bland. The soymilk is homemade and delicious. Lunch menus are sl.5-7. Wa Lok; Paruro 864; Chinese food, overpriced, greasy and not very flavorful. Portions are huge. Service is poor. Not very many exciting vegetarian options. Salon Capon; Paruro 819; recommended by my travel book, didn’t eat there. Looks like a lot of dim sum. Hi. I just tried a commercial version of emoliente that I bought at Whole Foods in NY. There were two flavors – one with blue corn and the other with flax seeds. It was so good, but so expensive, so I was hoping for a recipe. Your website is the first google hit, but you never posted your recipe. I was totally bummed! Unfortunately, I don’t have a recipe for emoliente. Every vendor made it completely different but I was able to get one guy to tell me about the ingredients. In grocery stores in Lima they sold emoliente “kits” which consisted of the dried herbs in a bag (I never tried it). If I ever figure out the recipe, I will post it on my blog. From watching them make it (you can see in the pictures that nothing is labeled) it was about half flax/horsetail goo and a dash of all the other ingredients to fill a 12-16 oz glass. I just found your blog doing research on emoliente, I’m involved in a branding project for Frutix (a chain of Peruvian juice bars). They are introducing a modern version of the traditional emoliente mixed with small pieces of fruit. If anyone goes to Lima you can try it at Frutix (located in major shopping malls like the Jockey Plaza), let me know what you think, I’ve heard the version from Frutix is really good. Fantastic blog, I recently came across it and I’m already a fan. I just dropped 30 pounds in thirty days, and I am excited to share my weight loss success with as many people as possible. If I can lose weight then any one can. No matter what you do, never quit and you WILL reach every one of your weight loss targets! Hi, I used to live in Peru and I so miss emolientes. I was lying in bed this evening with a cough and all I wanted was an emoliente. I also love the whole experience of watching the sellers pour it and attempt to mix the snotty gloop so that it is drinkable!! I used to have one each morning and night….I wish I could recreate it here in New Zealand…. I have tried but without many of the ingredients it lacks a lot. I think I’ll give it another go tonight anyhow since my cough is really annoying me. If anyone ever has a good recipe, please post it! cheers. Superb post however , I was wondering if you could write a litte more on this subject? I’d be very grateful if you could elaborate a little bit more. Cheers! Hey, I think your site might be having browser compatibility issues. When I look at your blog site in Opera, it looks fine but when opening in Internet Explorer, it has some overlapping. I just wanted to give you a quick heads up! Other then that, fantastic blog! There are a lot of food blogs out there! What exactly are you interested in? Vegan recipes? Travelling? New Ingredients? I can point you in the right direction, just let me know. What would you like to know specifically? Ingredients or history of the drink? It seemed to vary town to town the exact recipe.